travellingfoodies Celebrating Food! Celebrating Life! This is my first food post in the longest time. In fact, I’d neglected my blog for more than a month, being engaged in several events and activities, but mostly due to laziness actually. Indonesian month for AFF is coming to an end soon. So I better put up my posts before it is too late! 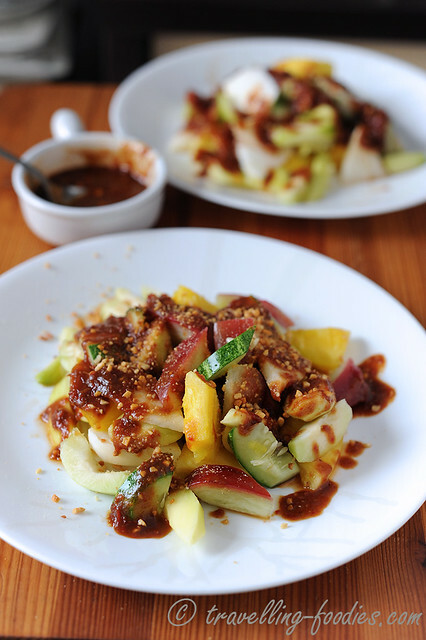 I’d always loved the local version of rojak! Youtiao and taupok toasted until they are wonderfully crisp before being snipped down to bitesize morsels, accompanying an assortment of cut fruits and vegetables all mixed in a thick and gooey sauce that is all savory, sweet and spicy at the same time! But that is the Singaporean and Melakan version. 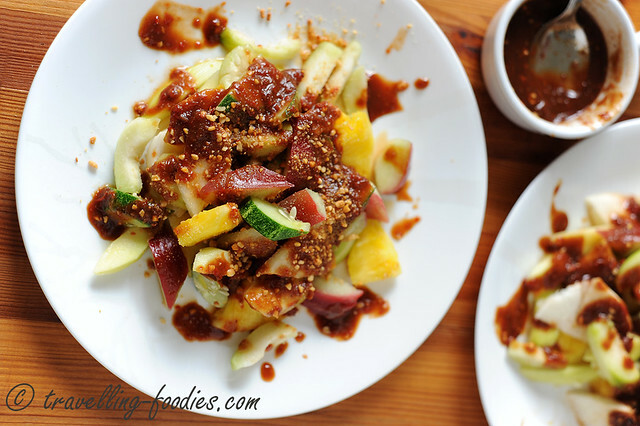 Rojak in Indonesia where it originated from and is called “Rujak” with a slight vowel shift, takes on a slightly different appeal but no less tasty! I especially love the incorporation of buah kedondong and ayer jambu in them. Comprising of fruits and vegetables with no fat or oil added whatsoever, it is almost cholestrol free making it a healthy snack to be enjoyed anytime! I was told by Alice, the host of this month’s AFF Indonesia theme, that Rujak takes on a plenitude of forms back home in Indonesia, using a much larger range of vegetables and fruits compared to what we have in our “standardised” form in Singapore. Meats and seafood may sometimes be incorporated but it is almost always the fruits that really take centrestage. The drizzling sauce can also vary considerably from a predominantly sweet broth to something which is immensely tart or spicy. Despite the presence of geographical variations found in various cities, towns and villages within a large country like Indonesia itself, nuances in styles can also be observed sometimes, between the various Rujak stalls along the same street market itself. 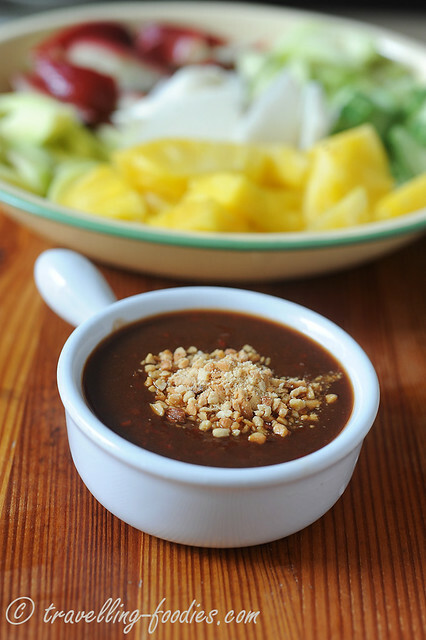 I’d chosen to make a Rujak version which is probably closer to what we are accustomed to eating in Singapore and Malaysia where a processed shrimp paste called “hae kor” (虾膏) is incorporated. fermented shrimp paste is used. In Indonesia, “terasi” is used instead. Folks from the Straits may not have heard of terasi but would have known it by its other name, i.e. “belacan“, which is essentially udang gerago (krill) which had been salted, semi-dried and left to ferment in the sun for days at ends until it starts to take the form of soft clay. Be it hae kor or terasi/belacan, both aim at imparting a lovely dimension of umami flavours which leaves one salivating just from the thought of it. 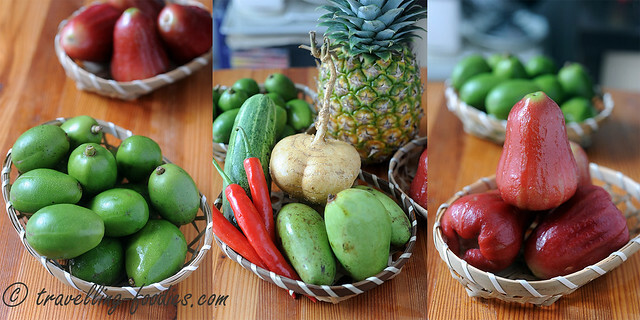 For the fruits, I chosen my favorites, i,e, buah kedondong and ayer jambu with an assortment of others to go along with. Ambarella or hog plums as they are more commonly known, I love this old school fruit for their tart flavours. 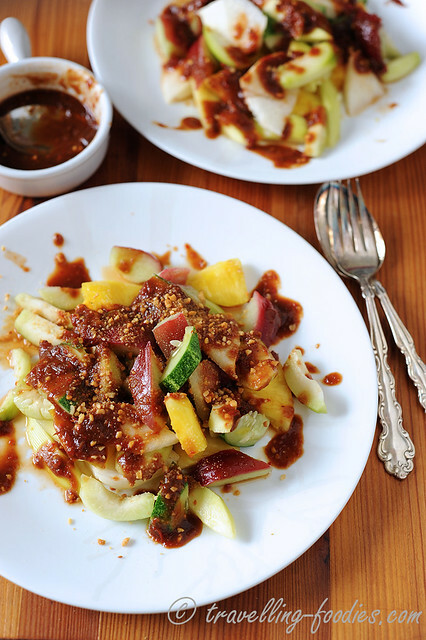 Ayer jambu goes as a wonderful accompaniment for buah kedondongs for their sweetness and crunchy palate sensations. I prefer the Thai varieties over the “local ones” as the latter tend to be quite sappy at the same time. We recently saw rose apples imported from Taiwan as well but their prices are way higher than those we get locally. 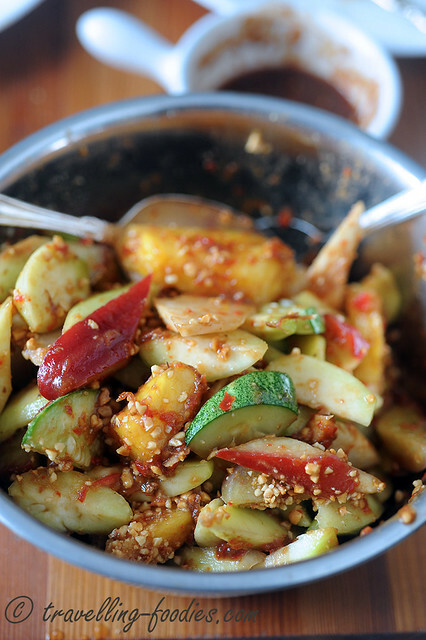 Additionally, pineapple, jicama, cucumber and green mangoes were also added for variety and colour! The term ulek refers to the crushing of the terasi/belacan in a flat mortar made from granite but we can always use a regular mortar and pestle or even our fingers. No fuss about it at all! Place all the bumbu ingredients in a blender and pulse until the chilies and pineapple are finely processed to form a coarse pulp. Adjust flavours and consistency with salt, fine-grained sugar and more tamarind water in accordance to personal preference. If spicier version is preferred, more red chilies or even cili padi can be used. But personally, I would go easy on the chilies as the highlight of this dish is really the fruity flavours from the ingredients used. In a mixing bowl, place all the ingredients which have already been cut into bitesize pieces into it. Drizzle with bumbu sauce and toss generously until well incorporated. Plate and serve with a sprinkling of crushed roasted peanuts on top. I am submitting this post to Asian Food Fest: Indonesia, hosted by Alice from I Love. I Cook. I Bake. This entry was posted on March 26, 2014 by Alan (travellingfoodies). It was filed under Food, Simple Eats and was tagged with air jambu, ayer jambu, buah, cucumber, green mango, gula jawa, gula melaka, indonesian, jicama, kedondong, pineapple, rojak, rose apple, rujak, spicy fruit salad, terasi, ulek. All images and writings are copyrights of this blog. Do not alter or edit them without permission. If you like our content and have a use for it, kindly contact us in writing. All rights reserved.